Owners Whitney Johnson and Barbara Horvath bring more than 30 years of combined professional experience to their business, and they bring a lot of heart as well. New clients are not treated like potential revenue, they are treated like new friends. 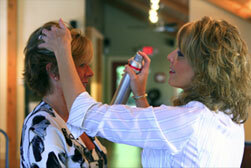 Appointments with their established clients are relaxed, comfortable visits.